I have a really incredible, useful-for-so-many-projects, little machine to show you today. And it’s sleek and compact. And sings to me as it works. I’ve got to tell you, once I opened up the box and saw all that it could do……I could hardly contain myself. My husband was studying for a final at the time and I kept making him turn around and look at the newest feature that I just discovered. He laughed at me……a lot. Ha! But there was so much to this little machine that I never knew something so small could do. The Silhouette hooks up to your computer and cuts out the shapes/letters that you tell it to. So all you need is your machine, your computer, and the cords to hook the two together. That’s it. It comes with many adorable shape and cutout files for no charge at all. And then you can use all of the letter fonts from your own computer, to design your own cut outs. You can even create your own shapes and logos, just how you like them. But if you want more, they have a little online image store, where you can buy all sorts of different shapes, letters, phrases, cutouts, etc……and then upload them instantly to your computer. It seemed like there were thousands. Each download is priced at $0.99 but the more you buy, the cheaper they become. They have a subscription going on right now where your downloads are as cheap as $0.14 a download. Love the savings! And I love all of the little promos they have (and the free weekly download). And they have designers that come out with new images each week. So the surprise came when I saw what you could do with all of these darling shapes and such. You can cut vinyl to match your home perfectly…..
And even make paper cut-outs for all sorts of reasons…. And wow, make the cutest little cards without the hassle of cutting so many different little things with scissors. And then like I mentioned in yesterday’s post, make glass etchings with the negative space of your vinyl. And then one more thing that I fell in love with. You can cut this stuff out, peel the negative space away, lay it on your fabric, then iron it right onto your clothing. For my little boy and girl….. 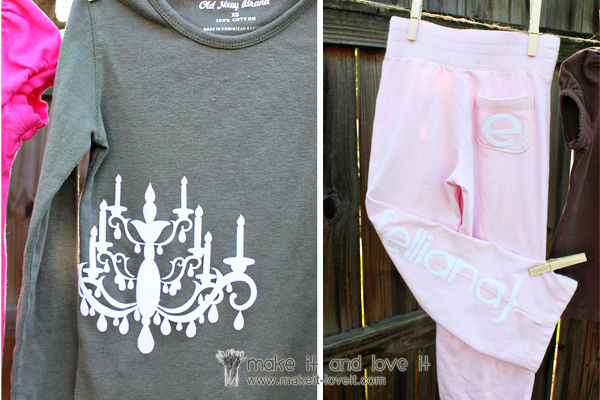 I used the white heat transfer and wrapped the chandelier cutout around the side of the shirt just a bit. Then I placed an ‘e’ on the bum pocket of these pants and a name down the side of the pant leg. Love how they both turned out. Then I used several car cut-outs and ironed it onto some brown knit. Then I put heat ‘n bond behind that, ironed it to the shirt, then stitched several times around the border of the brown. For the pink one below, I used some ballerina cutouts on some black heat transfer and ironed them right to the shirt. Then I cut little strips of fabric, gathered them, and sewed them right to the ballerina……like mini tutu’s. For this little tree shirt, I applied it the same as the car shirt above. Then finally, I found these cute little animal cracker shapes………..and I cut out a bite mark on one with some scissors. Then I put the words that my little guy uses, while munching on his favorite crackers. Sheets and rolls of vinyl and heat transfer found here. Can you believe all that the Silhouette does? There are many more projects I’m working on. So I’ll be sharing more this week. But now it’s time to talk about one of you winning one of these machines free. Yes, a machine all for one of you. Do you have some projects in mind? Some gift ideas that you must make? Visit the silhouette site here…….then browse around for a while. Then come back here and let me know in one comment how you would use your machine. So visit the site, comment back on this post, and you’re done. And Silhouette has offered another great offer for every Make It and Love It reader. Code will work by 4pm today (CST). Just think of how much you’ll save on gift giving this year! Remember to type in ‘Makeit’ at checkout to receive these prices! And I hope you have fun with these new ideas, especially if you get your own machine. Eeee! This Video Is A Great Reminder! A really great new tool........and GIVEAWAY (over $400 value)! It's worth a shot so I'll leave a comment. I use it to first finish dolling up our little home- you know, all those little accents that make a huge difference! Then I'd give it a try on some old clothes– to give them a good ol' recycle. Gosh- the question isn't, what I would use it for- the questions is what WOULDN'T I use this for!? Right now, I can think of all the ways I would make greeting cards for friends and family. I'm sure I would do the heat transfers as well. This product looks incredible. I would use it to make t-shirts – I LOVE the ones you've made, I would make cards with it, vinyl wording – so many things! This is the perfect item for a crafty person! I love your site – you've helped me overcome my fear of sewing with knit! Wow..if I am able to use it for cards, scrapbooking, clothing, home decor..why wouldn't I use it every single day for some craft!! I am a craftaholic but I don't own anything even close to this! Winning one would be truly amazing and it would change how I craft with my kids! Thanks for the opportunity! Thats so cool, I love it, I would use it for decorating clothing, can it cut fabric as well?! I would use this non-stop for my main craft – card making. I'm excited just thinking about the possibilities! Thanks for the chance to win! very awesome little machine! i love the vinyl cutouts for wall decoartions; i would especially use it in making cards! imagine all the cutouts — and less time with the scissors! thanks for the awesome giveaways! Oh wow!!! That is so cool! I love that you can use your own images, but also have the option to download them as well. I just love the shirts that you made. This seems so much better than the cricut! I would use it for EVERYTHING! We have a large family (over 50 people) and I make all our christmas gifts! That would be a huge help, time saver, cool idea… OMG I could go on and on!!!! Oh, I'd pretty much use it for everything. I would love one!! i would use it for all kinds of stuff, but mostly to help me cards, my new favorite craft. Hey what an awesome giveaway! I pretty much would do anything I could with this little puppy, but I love that it has the rhinestone templates and the heat transfer thing is great! 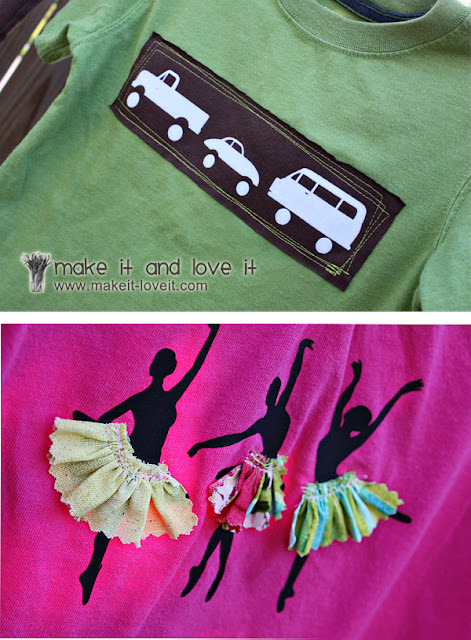 It is fun to make your kids clothes have a little something extra! But I also love that the site has tutorials! What a great help! Ohhh! Would love it if you'd pick me! I'd do EVERYTHING with it! Seriously, I would! I would use that thing for EVERYTHING!!!! Mostly for Vinyl though I think! LOVE THIS! I think I would use it for everything, but especially for wall decor. There are too many things I would use this for! Scrapbooking, vinyl wall art, clothing… Oh the possibilities! :) Thanks for the chance to win! I love the t-shirts, and the wall art the best! So cool! What a fantastic product! If I were to win this, I would use it for EVERYTHING- homeschool projects, crafts, gifts, home decorating, fashion statements, you name it! I would love to be able to do my own vinal, but now that I have seen what it can do for t-shirts? I may have found a new crafting love! Omg, that is AWESOME!!!! I have a Cricut that I use for scrapbooking/cardmaking, but I'm also into a bunch of other crafts, so I could see myself getting so much more use out of this! I like how you can just download designs/images for a much more affordable price. I would use this thing all the time!!! Scrapbooking, cardmaking, heat transfers, rhinestones…awesome! Thanks for the chance to win! I would LOVE to get this machine! I would to do etching, vinyl letter and much more. Thanks for your post! I would use it for EVERYTHING! I think this machine is awesome!!! I would use it for heat transfers and any other project that I could come up with. All sorts of gifts for people. Wow! I'd use it to make some shirts for my baby. I have seen similiar products but nothing as great and wonderful and easy to use. I would love to use it to make stuff for my boys, I am always trying to figure out what to make for boys, this little machine would come handy adding ties, trains and animals to their clothing. Wow!!! What's not to love about this machine! Oh my goodness, I've been wanting the Cricut for awhile, and have been holding off, because I feel like there would be something better out there – and TADAH! There is. Love the etching, and the vinyls. I can't think of what I wouldn't use it for! WOWZA! I can't even imagine all of the things that I would make but I would for sure be making some cute little baby clothes since we just found out that we are pregnant! I LOVE this thing! I would use it for invitations, decorations, clothing, any and everything I could get my hands on! I would use it for everything…but mostly for gifts and home decor. Hello, I would use it to decorate my 2 year olds room that we never finished/personalized for her. Thank you for the chance. I would use it for all the volunteer work i do. Just painted a brick wall for a school and making my own stencil's would have helped out a lot. Also when I help paint for habitat for humanity, this would be awesome too. Wow-I SO want one of these!! What an awesome giveaway! I would definitely use it for the vinyl lettering and glass etching and making cards and the t-shirts…pretty much everything! I have a million ideas, but first, my baby boy's room! And then some glass etching for my sister's wedding pressents! =) LOVE IT! wow what a lovely discovery… my head is swimming with possibilities for a nursery for my little pickle due in december! That is INCREDIBLE! I love how cute and sleek it is. I want it for the vinyl possibilities mostly, but I would totally use it for heat transfers and paper crafting too! Those cupcake holders just kill me. Wow what a great giveaway from a great company! I would definitely use it most in wall decor (I am military and move around a lot, and am always trying to find ways to make our house more of a home). But there are so many other things I would LOVE to use it for. Thanks again for such a great giveaway! I think I would like to use it just like you did- for applique on my sewing projects, and for scrapbooking of course! That's really neat and I like what you've done with it. If I won the Silhouette, I'd use it for all kinds of things for my sister's wedding in September. I'm envisioning fun shower invitations, classy wedding invitations, personalized gifts for the newlyweds, and embellishments for the eight dresses I'm making to outfit the bridesmaids, flower girls, and mothers. My sister doesn't want traditional lace and beading, this would be a great way to add some fun, modern touches. Wow! What a cool product! I would LOVE LOVE LOVE to use it for the heat transfers, among other things. I have been wanting to make t-shirts for my 4-H sewing groups! We are the sewing nerds! LOVE this product. Wow! So cool. I'd probably use it most for heat transfer and glass etching. It looks awesome! I would love love love this! Wall decor and clothing would be my ideas for using this great tool! Are you kidding me?! This little machine is amazing! the possibilities are endless, I would begin with the heat transfers, LOVE IT! My wife would love one of these for her birthday coming up. I'm sure she would use it for tons of things, especially home decorating. OMG! School projects, Scrapbooking, EVERYTHING. What an awesome tool to have!! I can't even say how exciting this product is to me..lol I have a cricut but cartridges are so expensive and there are not alot of them that I like personally so I would love love love this machine to do vinyl wall art etc. Well, where do I begin. So many uses…but I think I would start with vinyl. Thanks for the chance to win! ohmigoodness I want one of these so badly – I would use it for EVERYTHING. Seriously, everything, I might drive people crazy. The rhinestone feature is such a clever idea! I love that and I love the vinyl. I have 6 kids and I just want to personalize and customize EVERYTHING! And I especially love that you can hook it up to your computer and use what you already have. Excellent product! Oh my gosh, this product is amazing!! I would use it to make monogrammed wine glasses, t-shirts for the kids, and many fun vinyl projects!! There seems to be so many neat and fun things it can do! I would probably use this to make gifts – vinyl, heat transfer, so many possibilities!! Thanks for the giveaway! I would have to sue it first for the heat transfer capabilities, then the vinyl for labels, then decorating, then cards and scrapbooks, and and and. That would be a great tool to have around the house! I just checked out the site..WOW!!! This machine would be AWESOME to have!! I would use it for…ALOT of different projects! Wall art…clothes…glass etching…the list goes on and on!!! Thanks for the chance to win one of these!!! I know I would have to say what wouldn't I use it for! I would use for scrapbooking and use it to dress up my home! The list is endless! So very awesome!!! I have lots of friends getting married or having babies, so I would certainly use it a lot for glass etching on bakeware, frames, etc..
How fun! 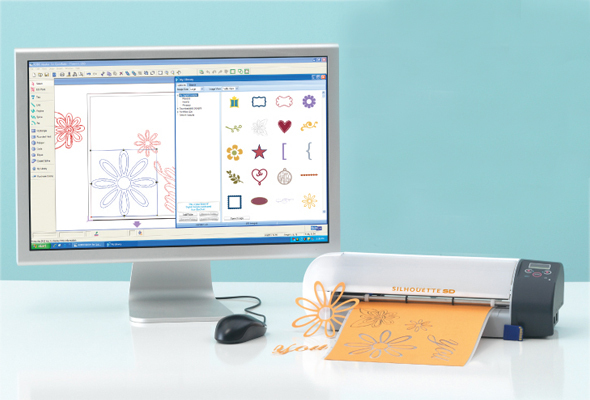 While I think I would use it for a lot of different things, I think I will mainly use the Silhouette machine for making cards and for making t-shirts with the heat transfers. I would love to have something like this and figure out how many different things I could do! I just died and went to heaven, right?! This machine would get used for everything imaginable! I would Love this machine! I think I would start out with making vinyl for the home (my walls are bare and have been for the past 2 years) and then move onto heat transfer. I have a pile of clothes that need to be refurbished. So cool. That is SWEET! I love all the things you made withit, especially the clothing. I would use this machine for all kinds of things. I would be making lots of heat transfers. I would also make cards and other fun stuff. I would love to win this and get my hands on such a great product. This machine is so neat!! I would definitely use it to make vinyl wall art for my fireplace mantel as well as the shirt transfers. The cut-outs would be perfect for our homemade cards and birthday invites!! This is the maching of my dreams!! It makes me so excited and beyond thrilled to think of all the wonderful crafts I could make with it, from scrapbooking to repurposing clothes. Not to mention I can't wait to use it for various things in my classroom. i've never won a giveaway, but i have to try this one! i would so use it for the iron on transfers, love that, and for the vinyl wall art at least. :) it would make making christmas gifts so much fun!! Oh my… I'd use it for all kinds of things! Probably mostly vinyl and i love the t-shirt ideas! And my MIL would likely be always asking to borrow it, so maybe I should have her enter too, lol. That way I could keep mine for ME! Oh my gosh I would use this for EVERYTHING!!! Cards, cute shirts for my little guy, cute shirts for me, cute decorations for the house…..mmmm….I'm drooling at the thought! I would use it to copy all of the cute crafts people do and say they used a Silhouette for! I would use it for scrapbooking, and for vinyl decor, and cards, and clothes…. pretty much anything and everything I could think of!! I would use for scrapbooking, card-making, vinyl art, heat transfer…oh, wait! That's everything! This is an awesome giveaway that I would love to win because it can do so much! I can think of a million things that I would love to use it on- I think after your glass etching post that would be the first that I would have to try. Thanks for the great give-oh-way! Wow! My kids and I would use it for scrapbooking and I would use it to make vinyl letters to label everything in the house!!! Oh my goodness, the Silhouette looks amazing! I just have to have one of these. I would most likely use it for scrapbooking and cardmaking, but it seems so versatile! Love it! A-MAZ-ING. Wow, I would use it for everything from vinyl to freezer paper stencils to heat transfers…this is so awesome! I would use it for scrapbooking and for room parent things. The real question is what would I NOT use it for? I'd for sure love to use it to create custom t-shirts for my kids. However, Etsy seller would be disappointed! I would use the Silhouette for everything!! I'd jazz up my home, upcycle some old clothing, redo my pyrex glass dishes.. etc..etc..etc.. so many uses for this little creature! I love the t-shirts idea! I really like that you don't have to buy expensive cartridges. I'd love to win this giveaway, but if I don't, I'm definitely saving up for a Silhouette! I love that this product allows me to have some creative flexibility by using the computer along with the cutting machine. Love it!! I would definitely use this in so many areas of my life. The first that comes to mind is decorating a educational corner in my little boys room. Then I'd probably do a lot of applique crafts after that. I would use it to make cutouts to screen print. I love the simplicity of using cutouts and the screen printer, but I hate the idea of cutting everything out individually so I usually use the photo emulsion method. Wedding invitations, here I come! I would use this for vinyl around the house. I have had my eye on one of these for a long time but no one has bought me one yet :(. I've been DYING to try my hand at vinyl and this would be a great leg up to start! And I'd also use it on clothes. OH man I hope I win!!! I would love love to win this! I would use it for EVERYTHING. The possibilities are endless. I especially love the heat transfers. So cool! i would definitely use this for card making! what a great giveaway. I would literally use this on everything. Boxes to give my hair clips in, centerpieces for my sons birthday parties, VINYL.. I have been dying to cut my own vinyl. Fantastic giveaway. Thank you!! WOW what an awesome giveaway. I would use the machine for vinyl and glass etching. Hope I win. wow, there are so many comments already! i really want to try etching and i'd definitely use it for that. I would love to use it for vinyl- decorate the nursery! I love how small it is, way more practical! This is awesome! I would use the stuffing out of the heat transfers. Also, because we are renters, I would love to be able to decorate with the vinyl. This would be perfect for all the scrapbooking I am currently NOT doing. i might actually tackle the heap if I had this nifty little gadget! I would use it to make cards and signs and also to add little personal touches and family logos to clothing for my son H and baby on the way. It looks sooooo cool.